Ben Zomer’s Cuttbow on the upper Cache la Poudre. August 1: RMF Youth Fly Fishing & River Conservation Day Camp continues from Jul 28-Aug 2. August 2: RMF Youth Fly Fishing & River Conservation Day Camp continues from Jul 28-Aug 2. August 9: Blue Lake-Indian Peaks Just south of Rocky Mountain National Park, the Indian Peaks area doesn’t see as much pressure as the Park. It should be a great place to explore. See our fishing page and contact Mark Miller. Fishing trip host will be David Morse. August 13: Board Meeting at 7:00 PM. Members are welcome to attend any board meeting. Check with a Board Member to find out where the meeting is being held. 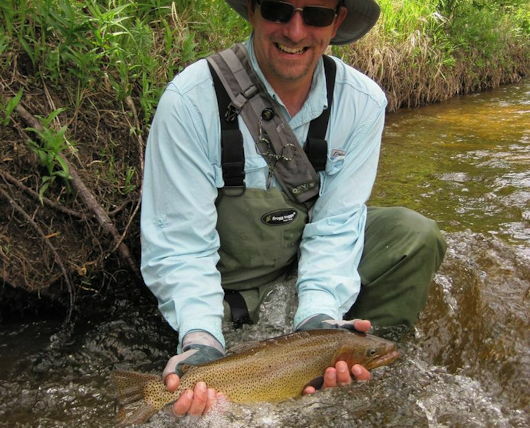 August 16: Colorado River Headwaters Billed as Bravo Brookies last year, the trip held up to its billing. Lots and lots of eager brookies taking just about anything. See our fishing page and contact Mark Miller. Fishing trip host will again be Dennis Cook. Rocky Mountain Flycasters/Trout Unlimited River Trail Leaders will work with a team of volunteers to mow vegetation in the trail, trim back trail-side vegetation, and rebuild rock cairns marking safe river crossings. Afterward, volunteers will be able to do some catch-and-release fishing in the canyon. See the Phantom Canyon Page for more details and volunteer signup contacts. Backup in case of unsuitable conditions will be 24 August.